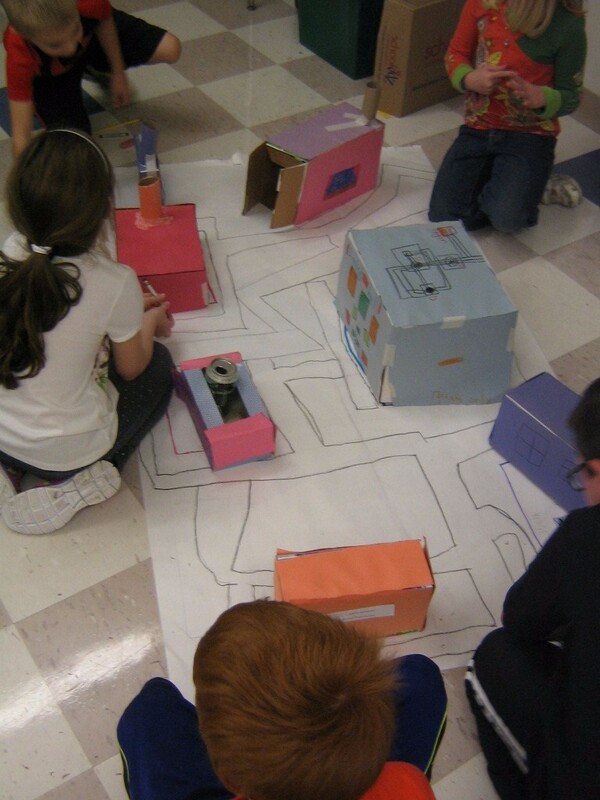 Second grade students in Andrew Hacket’s class at the Mayo Elementary School in Holden, MA, recently completed a 10 week integrated science, social studies, and literacy unit named Recyclable City: Designing Against Disaster, in which they became project managers, city planners, cartographers and civil engineers. After learning about citizens, types of communities and the basics of economics, students were tasked with imagining and creating their own community. Each student completed a “building permit” outlining their plan for constructing a business/building for their city and describing how it would provide for the needs and wants of the community. Students then raided their recycling containers to provide the necessary building materials. Following the building phase, students put on their cartographer hats as they learned how to read and create maps of their own using symbols, keys and labels. These skills were immediately put to use as students created roads and added symbols to their 3D recyclable city map. “Andrew Henry’s Meadow” by Doris Burn served as the inspiration for the next step in the unit. Just like the boy in the story who built homes for his friends based on their personal interests, the second grade students designed and built their own homes reflecting their personalities and interests. These were made from construction paper and immediately added to a new classroom map. As students learned about landforms, symbols were created to represent them and they were added to the map and key. Later, after learning about earth’s fast and slow changes, students returned to class one day to learn that natural disaster symbols had been added to their map. The homes that they had just created were now in danger and it was up to them to devise and create a solution to protect them from harm. Students implemented the engineer design process to imagine, plan, and construct systems out of recyclable materials. Finally, students were asked to improve their designs, taking into consideration how they could harness the natural power of the disaster to store or repurpose the energy to benefit their home or community.